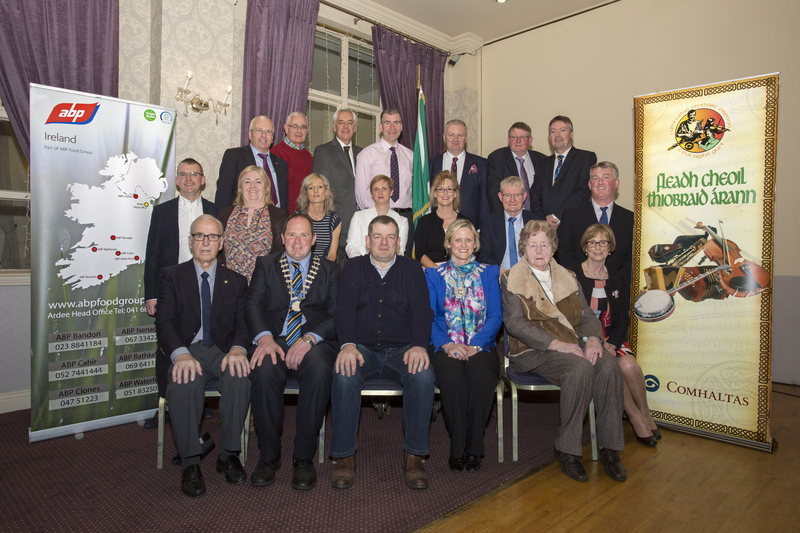 The Launch of the Tipperary County Fleadh Cheoil 2017 took place in Cahir House Hotel Cahir on the 22nd of April @ 8pm. Cllr Siobhán Ambrose, Cathaoirleach of Tipperary County Council, Mattie Mc Grath T.D. Cllr Andy Moloney Mayor of Clonmel Borough and District Council, Paul Murray,District Administrator Tipperary County Council and Carol Creighton, Tipperary County Council. Richard Burke ABP Meats and members of staff of ABP Meats. Michael Harty Cahir Comhaltas with Gerry Duffy Cathaoirleach of Cahir/ Tipperary County Fleadh Committee Micheál Fahy Treasurer, Kevin Ryan and Mary Harty joint Secretaries, Tom Hyland Finance, Yvonne Fahy, Fiona Fitzgerald and Linda Forristal Dramaíocht agus Gaeilge, Gerry O Donnell Traffic Management. Also present were Comhaltas Members from Powerstown Lisronagh, Cashel and Newcastle Branches. We were also joined by the Principal of Cahir Boys National School Brendan Horan. Hughie O Donoghue, Shamrock Lounge Cahir and official local caterer for the Fleadh weekend. Representatives from Cahir GAA Club also attended the Launch. Cahir Comhaltas wonderful Seisiún Group “Ceolta Feasa” performed on the night and they again did their Branch, their music teacher and their parents proud. Guest Musicians on the night were Billy Clifford, Tommy Kennedy, Siobhán O Connell, John and Conor Hartnett. Nora and Pat Swan a wonderful couple and lifelong friends of Comhaltas joined in song, and the lovely Amy O Dwyer danced with the group. Cathoirleach of Tipperary CCÉ Michael Murphy explained what the Fleadh was all about and he acknowledged the work put in by the committees of Fleadhanna down through the years, he commended teachers on their work with students and parents for their commitments. Cllr Siobhán Ambrose paid tribute to Cahir Comhaltas and the work put in by Michael and Mary Harty.She thanked all the Comhaltas County Branches for their financial support and complimented the Tipperary County Board for their unfailing support to the host branches down the years. She added that there are over 800 entries for this year's Fleadh over the two days bringing extra business to Cahir and Siobhán also praised the Music Teachers and Branches for their achievements. She with Mayor Andy Moloney and supported by Paul Murray and Carol Creighton said they were delighted once again to support the County Fleadh and Cahir Comhaltas who are hosting the event in 2017. Mayor Andy Moloney joined in with Siobhán with wishing the Fleadh Committee every success and Andy spoke of how suitable a town Cahir is to host such an event and suggested we we should work towards hosting a Munster Fleadh in Cahir in the near future. Mayor Moloney has given invaluable support to the Cahir Trad Fest for the last two years. TD Mattie Mc Grath spoke about the annual summer Seisiún, a project of Cahir Comhaltas and produced by Michael Harty, this is a summer show of music song and dance held in Cahir House in July and August where Newcastle and Cashel members also join the group. They entertain locals and visitors from home and abroad. Mattie wished the best of luck to all competitors taking part in the County Fleadh in May and going onto Munster and All Ireland later in the summer, he is a great supporter of cultural programmes. Cahir Fleadh Cathaoirleach and Fear a Tí Gerry Duffy (who did an excellent job on the night) paid tribute to the Cahir Committee for their hard work in getting the finances to achieve all the preparations that's required for the smooth running of the Fleadh, he also thanked the County Board of Comhaltas for their guidance. He both pointed out and thanked the 2 host schools Cahir Boys National School and Our Lady of Mercy Primary School for their premises to hold the Competitions all day Saturday and again Sunday 20th and 21st May and also Cahir House Hotel for their facilities for Sunday's competitions. ABP Cahir employs over 600 people and is a major economic boost to Cahir and District. Richard said they are delighted to support this cultural event and particularly as it involves young participants, he wished the County Fleadh every success. It was a wonderful Launch Night, music song and dance was amazing and all went away very happy. Cahir House Hotel did a great job on the night.